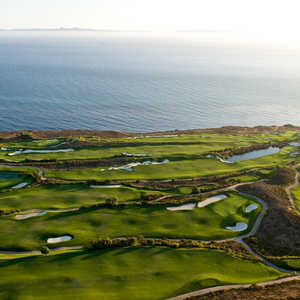 RANCHO PALOS VERDES, Calif. -- When you are gazing out at Catalina Island from The Links at Terranea, a new, nine-hole golf course on the Palos Verdes Peninsula just south of downtown Los Angeles, there are a multitude of scenarios that can leap through your mind. The Pacific Ocean is a borderline-distracting view at the Links at Terranea's No. 8 and 9. That expanse of Pacific Ocean between you and Catalina is called "Whale Road" for obvious migration reasons. Point Vicente Lighthouse is within sight, and the "site" has a colorful history. This priceless land, less than five minutes from Trump National Golf Club, was once home to Marineland of the Pacific, a forerunner to today's Seaworlds, opened from 1957 to 1987. Vividly positioned above the Pacific Ocean on 102 acres with a 270-degree panorama, Terranea Resort might be Southern California's premier coastal resort destination. 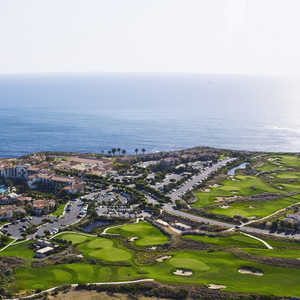 And its new nine-hole course, opened in June 2009, signals a new niche in today's economy, where new construction has almost come to a halt in the U.S.
"This course is not easy," said Chris Crocker, who lives in Palos Verdes Estates. "It's basically like playing any of the best championship courses minus the tee shot. The approach shots are hard, the bunkers tough and the greens are difficult. I love this place. 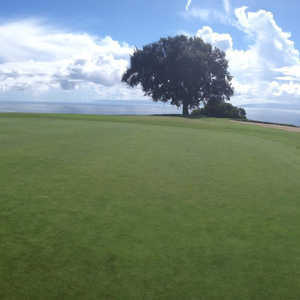 It has a good practice area for chipping and putting, and the views are incredible. This is an ideal place to take a beginner or take your kids." That's exactly what Links at Terranea course designer Todd Eckenrode had in mind. "It is quite distinctive, and I feel very relevant to today's needs in golf - fast, affordable ($30), fun and open to all," Eckenrode said. "I played it recently with my 5-year-old son, 6-year-old niece, 10-year-old niece and two 12-year-old nieces. There are not that many courses where you can do that without a problem and still enjoy yourself!" The Links at Terranea, which is a walking-only course, offers a style reminiscent to old-school design that you might have seen in the '20s and '30s, Eckenrode says. "It has a natural look, and I wanted it to appear that it had been here for years," he said. "I wanted to create putting complexes that blend into the environment, with greens that were crowned or inverted, ones with huge feed slopes or kick slopes, meaning you could land the ball short of the green and feed it into the green. And I wanted to promote playability and a multitude of shot-making options. The greens have various fall offs so you won't walk off the green saying you thought they all played the same." It is hard to pick favorites on a golf course that has so many incredible ocean views, but the finales point right at Catalina Island. The Links at Terranea's eighth hole is a 173-yard downhill shot toward the ocean, and the last is called Whale Road, a 121-yard short iron to a green, bunkered in back on a bluff's edge. The lone tree in play on the golf course, a willow, guards the right side. No. 6, called Portuguese Bend for that view, is 145 yards to a punchbowl green that feeds short shots onto the surface. The seventh is another punchbowl, a 150-yard uphill shot such as the one was made famous at National Golf Links of America in Southampton, N.Y.
Crocker has a sensible verdict: "I play there twice a month, largely because it is easy to just show up without a reservation and walk straight on, which is saying something in L.A. Even on a Friday at 1 p.m. you can just walk on and play golf without waiting. I never encounter waiting times. "A friend of mine recently said that if it was 85 degrees and humid, you would think you are on Maui with the cliffs and view of the island," Crocker continued. "Also, the condition of the course can hold its own with Trump National or Pelican Hill -- the fairway grass and greens are first rate. Again, it is not easy. Most of the nine-hole courses I've played are like mini-golf warm-up tracks, but not here." Terranea Resort is a 582-room luxury resort that includes a 360-room hotel with 32 suites and even closer to the Pacific are its Villas, Casitas and Bungalows. There are seven restaurants, but I picked Nelson's, named for the Mike Nelson character Lloyd Bridges played on the popular television series "Sea Hunt," filmed on-site at the old Marineland of the Pacific. The restaurant features old Sea Hunt promotional posters, a bar countertop made of recycled wine bottles and a menu that is Southern California – try the chipotle shrimp tacos, seared ahi sandwiches, goat cheese salads and sweet potato fries. You can even bring your dog for the outside seating. With 102 acres, there's a myriad of other activities. The Portuguese Bend hike takes guests 1,000 feet above Terranea, you can rent a bike or go horseback riding. Quiksilver Perfect Day Surf Lessons are offered along with kayaking, scuba diving, volleyball and paddle board lessons. And there are spectacular swimming pools, too. Also, don't miss visiting the Point Vicente Interpretive Center less than a mile from the resort. This is a great place for beginners and ladies groups. Much more fun than the uppity Trump National just down the road a mile.